My husband and I were driving past Makorwane dam and it was just after 11H00 on Thursday 21/03/2013 when we heard a strange noise coming from the dam. Initially we thought it was the hippo, but on driving past the dam, we saw a crocodile attack a zebra that was drinking from the dam at the time. 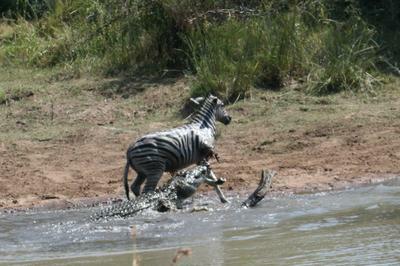 The first photo shows the crocodile having bitten off the zebra's front leg. The second photo shows the crocodile going back for a second time. 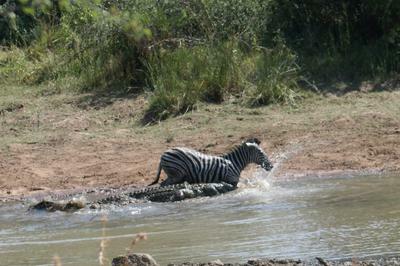 The crocodile eventually pulls the zebra under the water. We have been going to Pilansberg for close on 20 years and this is the first time that we have had a sighting like this. What an adrenalin rush it was. That's quite a set of photos. Maybe we need to visit this park on one of our trips. Congrats. Wow, thats a great action sequence. thanks for sharing. 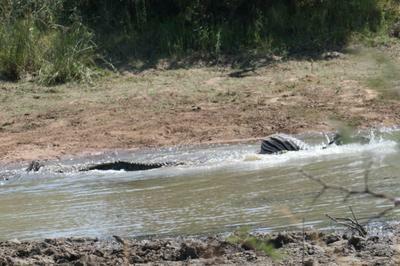 We have been to the Pilanesberg many times and have never even seen seen a croc trying to catch something. This is a once-in-a-lifetime shot - well done for capturing the action! Just from the look on the zebras face tells me he/she did not know what hit it…it looks stunned! Looking at your pics and reading your story gave me an adrenalin rush, wow what a rare and incredible sighting in the Pilanesberg, thanks for sharing it with us Shelly.